From computer animation to the visual arts, the outstanding quality of British art and design is acknowledged 1. about/around the world. Take the amazing Angel of the North which soars above the A I road at Gateshead, north-east England – the 2. largest/larger public sculpture ever erected in the UK. Its 54 metre wingspan 3. are/is nearly as large as that of a jumbo jet’s. At 20 metres high and weighing 200 tonnes, it 4. includes/contains enough steel to make 16 double-decker buses. Each 5. wing/wings alone weighs 50 tonnes. The sculpture is the 6. creature/creation of Antony Gormley, one of the UK’s most innovative artists. He has exhibited work around the world and his major public 7. work/works can be seen in Japan and Australia, Norway and the USA. Antony Gormley is best known for having pioneered the technique of using his own body as a ’living mould’ for life sized 8. figures/ shapes in bronze and other metals. 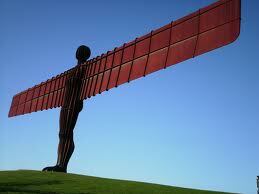 The Angel of the North was 9. constructing/constructed on land where the bath houses of a former coal mine once stood. Now it predominates 10. a/the countryside for kilometres around.